oday’s video is a special one as it hold a special premiere. This time Samsung are way ahead of the others, they became the first brand to bring Windows 8-based smartphone to the consumer market. We first saw the device on the IFA 2012 in Berlin but now DigitalMagnet finally can show it to you. Dear digital viewers, this video review will introduce to you the Samsung Ativ S.
The chassis definitely stands out from the ordinary looks with the interesting metallic hairline glossy finish on its plastic backside. It makes the appearance stylish and sleek. 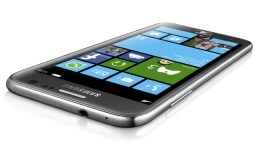 Samsung ATIV S’s dimensions of 5.4×2.78×00.34 inches make it a rather big phone as it maybe stands the closest to the Galaxy SIII. It is as slim as 8.7mm and weighs only 135g. In my opinion it will be a bit too much of a size for the people with small hands like myself especially when they need to operate with just one hand. The built-in memory available to the consumers can be either 16 or 32GB, but fortunately you can expand it as on the periphery line we find a microSD slot for up to 32 more GB. However the SkyDrive feature you will find on the Windows 8 platform provides 7GB of free to use interactive storage that holds up to 7GB of your document, photo and contact info. The RAM is 1GB. The 4.8-inch HD Super AMOLED display is what excels the most about this mobile device. Its brightness in combination with a wide viewing angle make the work with the phone pleasant both in and outdoors. The sharpness is also not to miss. The resolution on this wide screen is 1280×720 pixels, we were also pretty impressed by the excellent pixel density of 306 ppi. This enhanced viewing experience is delivered by a graphic chipset Adreno 225. The touch-sensors provide an immediate software response to every single gesture and multitouch commands as well. The screen is protected by the Gorilla Glass 2 technology. Below the display there is a physical home button, which carries the Windows 8 logo and on the two sides you will find two touch-sensitive auxiliary keys one for the go back command and one for the search command. From Samsung have provided excellent performance on this elegant smartphone with the dual-core Krait processor at 1.5GHz. We must also mention the HSPA+42 connectivity for a faster and better browsing experience. On the right top corner stands the 1.9MP lens for video calls. It provides unusually good quality images for a secondary camera. The base one is a 8MP one at 3264×2448 pixels. Its performance in low-light conditions is facilitated by a LED flash. The base camera also records in FullHD at 30fps. Is it just me or it feels weird and how to say it.. just not right to take a picture with a tap on the screen. Personally I like it when the phone features a physical button to capture images with, it easier to focus and snap, ATIV S was a pleasant surprise to me as its periphery features one. The Windows 8 platform gives you access to the well-known to all of us Microsoft Office applications that are the most flexible and commonly-used business and education tools. As I already mentioned the SkyDrive application which provides free access to a virtual storage. Windows 8 menu is a slide one where you see the applications in a flexible and intuitive interactive grid. I guarantee you will see this one more and more often not only on smartphones, but tablets as well. The ATIV S device by Samsung connects easily through the microUSB port. The more and more commonly used NFC technology is also available. You need to keep in mind that you need to change your SIM card with the more compact microSIM version if you make your choice in favor of this model. The standard Li-Ion 2300 mAh battery provides a long-lasting battery life placing the phone just a level above the Galaxy S3 with the 200mAh more.